A passenger was ejected from the Costa neoRiviera in the Indian Ocean for staging a “mutiny” after the captain cancelled two island stops as a health precaution and gave passengers $220 in compensation to spend on board. Trouble started two days into the voyage when the captain announced that three stops around Madagascar were cancelled due to a plague epidemic on the island, the Telegraph reported. Madagascar is experiencing an outbreak of bubonic and pneumoic plague that the World Health Organization has said is a serious risk to the wider Indian Ocean region. “We said OK, it’s for health reasons and anyway there were two other excursions left in Nosy Be and Diego Suarez,” he told Le Parisien. But the next day, passengers learned that these other two stops were cancelled, and the ship would not be going to Mauritius either. Tempers then flared when they were informed that they would receive €150 to spend on board by way of recompense. “Things started heating up – €150 when a major part of the trip is cancelled and a drink on board costs €5,” Jan said. When he failed to receive a satisfactory response from the crew, Jan started a petition. Then he and other pax ramped up the protest. “That evening, we organized a protest in the restaurant. There were 60 of us banging our fists on the table to alert other cruise passengers to this con job,” he said. When the captain refused to change course, mutinous passengers staged a second protest in a theatre as the ship was nearing the Seychelles. The captain called the local police chief, who came on board. Jan and his wife were escorted off the vessel. “I spent two nights in a hotel in the Seychelles with my wife, then were flown home paid for by Costa. That’s how I was freed from the floating prison,” he told Le Parisien. 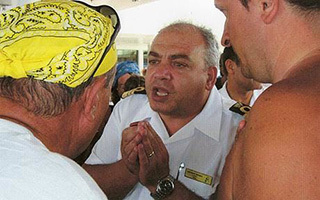 Jan and others alleged that Costa Cruises had known of plague cases for months but deliberately hid the itinerary changes from passengers beforehand. Costa Cruises denied the claim: “The company made every effort to maintain the stop-offs on Madagascar, looking into all the alternatives,” it said in a statement. The line added that health authorities on Mauritius had expressed “serious concern” about the situation in Madagascar, effectively demanding the ship be quarantined to ensure it had no sick passengers. “Given the delays that would have created, and even longer ones if there were any suspect cases on board, and considering that passengers were already on board, the company was forced to restrict its trip to the Seychelles and Reunion,” said the statement.